This cave is in the style of a small assembly hall and a truncated pyramidal ceiling (Figure 1). The niche in the main (west) wall has the same form as the main chamber as if it were a separate chamber. The truncated pyramidal ceiling of the niche serves as a tent-like decoration or a canopy for the whole group of statues inside, while its opening is decorated with elaborate floral patterns. Inside the niche, the Buddha is missing while six statues remain. They still maintain the appearance of those from the High Tang period, except that none has a halo. The statues, especially the two flanking Bodhisattvas, have plump faces, long eye contours and red lips (Figure 2). Their bodies curve smoothly and beautifully underneath the silky dhoti and sash. The devarajas’armour is in the Khotanese style which is different than that of metropolitan China. The bigger pieces of armour are created by stucco moulding. The smaller pieces and detailed decorations are depicted by painting. Such combinations of stucco moulding and colouring display the statues and their armour perfectly. Another different trait is the tall rectangular panels at the back of the niche fabulously depicting monastic life, although they would have been mostly concealed by the statues. Now, a couple can be seen clearly because of the missing Buddha. 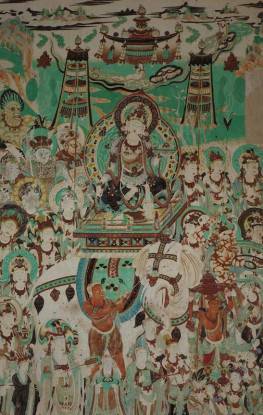 The wall spaces on both sides of the niche are wider than those in other caves.Samantabhadra (Figure 3) riding on his six-tusked white elephant is on the south side, while Manjusri (Figure 4) on his green lion is on the north. Both assemblies are advancing on clouds towards the Buddha statue, which was originally seated between them in the niche,with an entourage including other Bodhisattvas, dharma protectors, musicians, dancers and attendants. The symmetrical processions appear very happy and relaxed. 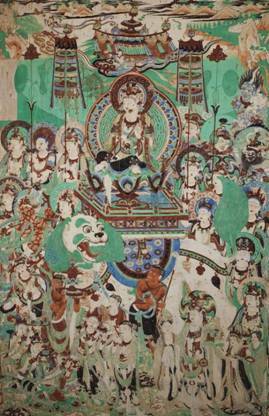 Right below the two Bodhisattvas, the two animal guides are depicted realistically. Their dark skin and costumes show that they are minorities from far away. The musicians playing different instruments are also animated; they seem to sway with the beat. 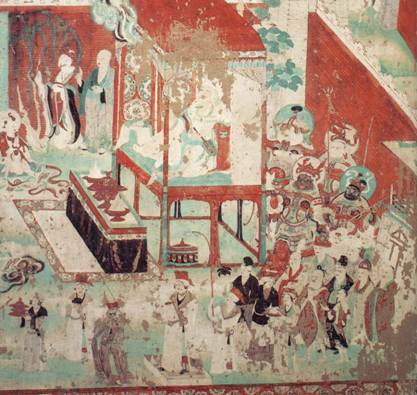 The depiction of the performers in this procession is one of the best examples in Dunhuang. An interesting image on Manjusri’s top right is a blue demon holding a naked baby, while a loving expression can be seen on his/her wrathful face. It is a harmonious contrast. There are a number of suggestions as to who this image may be, but no conclusion has yet been reached. On each of the south and north walls are three large panels of differentjingbian. Beneath each are three small panels in the dado area providing further explanation. For instance, beneath the illustration of the Sutra of the Medicine Guru are small panels with the Twelve Great Vows and the Nine Forms of Violent Death depicted. To illustrate multiple sutras on a single wall became the trend. 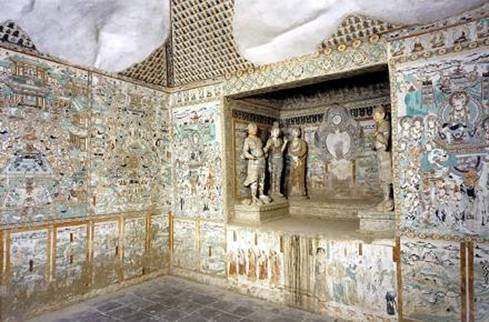 It is no longer one jingbian or multiple narratives from a particular sutra occupying the whole wall; instead framed panels divide the wall space with one sutra in a panel. Thus images and all elements in each scene had to be considerably reduced in scale since many more subjects were depicted on a wall. On both sides of the entrance on the east wall is the Debate betweenVirmalakirti, the rich laity (Figure 5) and Manjusri, Bodhisattva of Wisdom. This time, the audience under Vimalakirti is the Tubo (present-day Tibetan) king and his entourage, indicating that this cave was built in the era of Tubo rule. The detailed depictions of the contemporary Tubo attire and customs provide a lot of information for artists and scholars. In general, the colours of the paintings in this cave are no longer bold, but more muted, mainly white on a green background. It is quite a unique contrast compared to the rich and dazzling colours used in the first half of the Tang. The depictions of the people however are more delicate and detailed in this period.